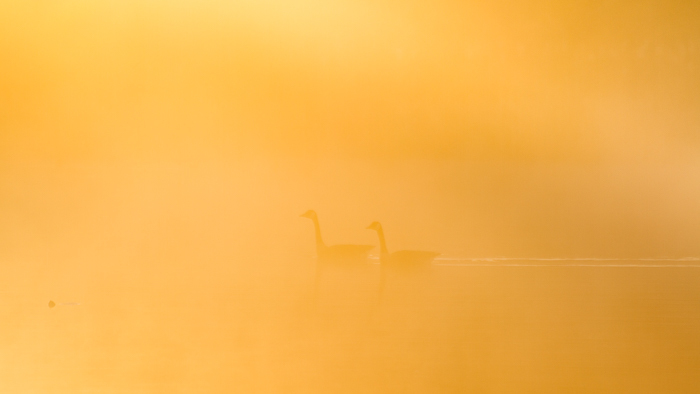 Two Canada geese (Branta canadensis) swim into a fog bank backlit by the rising sun, Great Swamp Wilderness, Great Swamp NWR, New Jersey. Canon 7D, Sigma 70-300mm f/5.6 lens, ISO 100, f/6.3, 1/500th of a second. Recently I've been spending some time hiking (wading?) the Great Swamp Wilderness in New Jersey for a book project I'm working on. Since today is the 113th anniversary of the National Wildlife Refuge System, it seemed appropriate to share a few images from one of my trips. On March 14, 1903, President Theodore Roosevelt designated Pelican Island in Florida the first US (and world) wildlife refuge. Incidentally, Pelican Island itself was also later designated a federal wilderness area as well. The eastern portion of Great Swamp National Wildlife Refuge was designated as wilderness in 1968, making it the first wilderness in the National Wildlife Refuge System and the Department of the Interior as a whole. With the exception of the near constant sound of aircraft overhead, once you are out in the middle of this wilderness, you would never know you were only 26 miles west of Times Square in NYC. If you are a connoisseur of Northeast wetlands, the Great Swamp Wilderness has a little bit of everything for you. Wooded wetlands, shrubby wetlands, small streams, large brooks, open ponds, large open cattail marshes (mostly) unspoiled by Phragmites, and vernal pools of all shapes and sizes. Bring your Wellies or hip waders, and/or expect to get wet and muddy, both on trail and off in this wilderness (with a name like Great Swamp, really, what were you expecting?). Besides mud, the wildlife is also abundant, with a couple of trips in March yielding great looks at otter and mink, plenty of wood frogs, plus wild turkey, bald eagle, and plentiful wood ducks, among many other avian species. 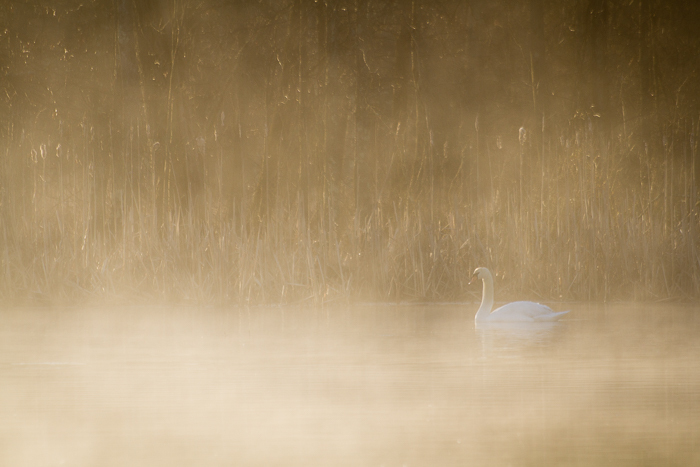 A non-native species gone wild, a mute swan (Cygnus olor) is surrounded by tendrils of fog rising off the warm water in the cold air at sunrise, Great Swamp Wilderness, Great Swamp NWR, New Jersey. Canon 7D, Sigma 70-300mm f/5.6 lens, ISO 100, f/6.3, 1/250th of a second. Great shots. Sounds like a great place too. I could use a little mud in my life once in a while.